WolfCop director Lowell Dean has released the trailer for a secret post apocalyptic film called Supergrid. Raven Banner is bringing the film to the Cannes marketplace. 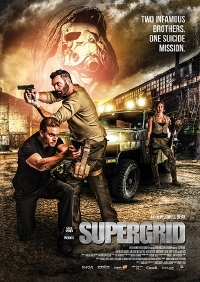 In Supergrid, two estranged brothers must travel the notorious "Grid" in their quest to collect and deliver a mysterious cargo. En route they must contend with road pirates, rebel gangs, and each other. Leo Fafard of WolfCop stars alongside Marshall Williams (Glee), Natalie Krill, Jonathan Cherry, Tinsel Korey, Fei Ren, Amy Matysio, Daniel Maslany, and former WWE wrestler Jay Reso. Developed through NSI Features First, SuperGrid is funded by Telefilm, Creative Saskatchewan, SuperChannel, the producers and Raven Banner.